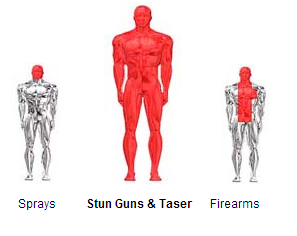 TASERs are designed to be used in three distinct ways. After the probes are shot and while the wires are hanging from the front of the weapon, the hand unit can still function as a contact stun gun, a very useful feature in case the probes miss the target. The TASER can also be used as a contact stun gun even after removing the spent cartridge. Once the air cartridge is triggered it is a simple matter to click a button, remove the used cartridge, then plug in a fresh one, all within a couple of seconds. TASERs provide the diversity of both long-distance protection and close quarters defense. The front of the TASER holds a replaceable air cartridge powered by compressed inert gas (nitrogen). 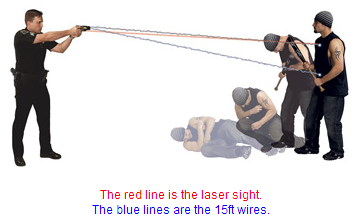 When triggered, the TASER fires a pair of barbed metal probes which are attached to the unit by 15-foot long insulated wires which are highly conductive. The device delivers a 50,000 volt shock which is capable of penetrating up to a cumulative two inches of clothing. The pulsing, high voltage electrical charges sent by the weapon are similar to the normal electrical signals in the body’s nerve fibers and literally overpower them. These additional electrical pulses function like jamming a radio or telephone signal. As long as the extra “noise” or static is on the line, normal service is interrupted. Once the jamming signal is stopped, normal activity resumes and no damage has been done. Central Nervous System – This part is the command center and includes both the brain and the spinal cord. All the information and decision making processes occur within this part of the nervous system. Sensory Nervous System – This part includes nerves which carry information to the brain. These “intelligence gathering” nerves provide information about the environment (hot, cold, wet, dry, etc.) and the state of the body (pain, pleasure, body position, etc.) to the brain where the data is processed. Most of these nerves lie near the surface of the body in the skin where they come in contact with the environment and gather data. Since these nerves are in or near the skin, they are easier to stimulate than deeper nerves. The result is that lower powered stun guns only affect these nerves. Motor Nervous System – Command signals from the brain to the muscles which control movement are carried by these nerves. 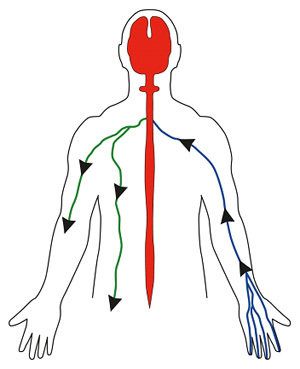 These nerves are protected by their location which is deep inside the body. They lie within and beneath muscle tissue. A much greater amount of raw power is required to reach them. TASERs deliver the blunt strength of penetrating waveforms, the Shaped Pulse Technology, deeply enough to control these motor nerves. Controlling the motor nerves while stimulating sensory nerves results in Neuro-muscular Incapacitation (NMI).NMI systems affect BOTH the sensory and motor nerves. TASERs do not rely on pain to achieve compliance. They affect the sensory and motor functions of the nervous system and achieve complete incapacitation.